Ideally Located on Florida’s Sunny Gulf Coast – Minutes From Many of America’s Best Beaches. The apartments are situated on the shores of beautiful Lake Tarpon in the small and quaint town of Palm Harbor, just north of the famous beach resort of Clearwater with mile after mile of white sandy beaches all the way down to St Petersburg. We are also just south of the well-known tourist town of Tarpon Springs. The big and exciting city of Tampa together with it’s International Airport is just 30 minutes away, with the major theme parks in Orlando only 90 minutes drive away. You will need a car to stay here. The Clearwater area is a popular tourist area with many restaurants, bars, shopping malls and although they are just minutes away the road layout in this area means they are spread along the main roads that cover this area and are not suitable for walking to. Come stay with us and you will find you can relax and recharge your batteries in a comfortable setting yet just minutes away you have all the activities and amenities that you could ever wish for! Relax by the pool and in the Jacuzzi and enjoy the waterfront environment. On your doorstep are an abundance of malls, restaurants, parks, beaches, golf courses, cinemas and endless activities for everyone – regardless of age. Lake Tarpon Villas is a modern, stylish, low-level apartment complex with direct access to seven-mile long Lake Tarpon (the second largest lake in Florida) which is great for bass fishing and water skiing. Both apartments look out onto water, boardwalks and boat docks. Often you will see fish in the water and storks and herons right outside on the decking. Our gas-grill-BBQ is on the decking right by the waterside. There is an open-air swimming pool which has solar panels to heat the water in the winter and cool the water in the summer. There is a Jacuzzi, sun loungers and picnic tables where you can relax alongside the boat docks and waterside. Next-door is a boatyard from which pontoon boats can be hired and docked adjacent to the apartments at our own private mooring. Both apartments come complete with all vital appliances (dishwasher, microwave etc.) and utensils together with Cable TV with over 80 channels, DVD player and telephone with free local calls. For your convenience we have installed a computer with free high-speed Internet access. You can see more detail and pictures on these pages: Interior 1-bed and Interior 2-bed. Be sure to check out our Area Page as we have plenty of information on activites in the local area, including many links to other websites to give you the best possible fun-packed vacation. Of course most people coming to stay with us want to know what the beaches are like. Well luckily we are minutes away from many great beaches. 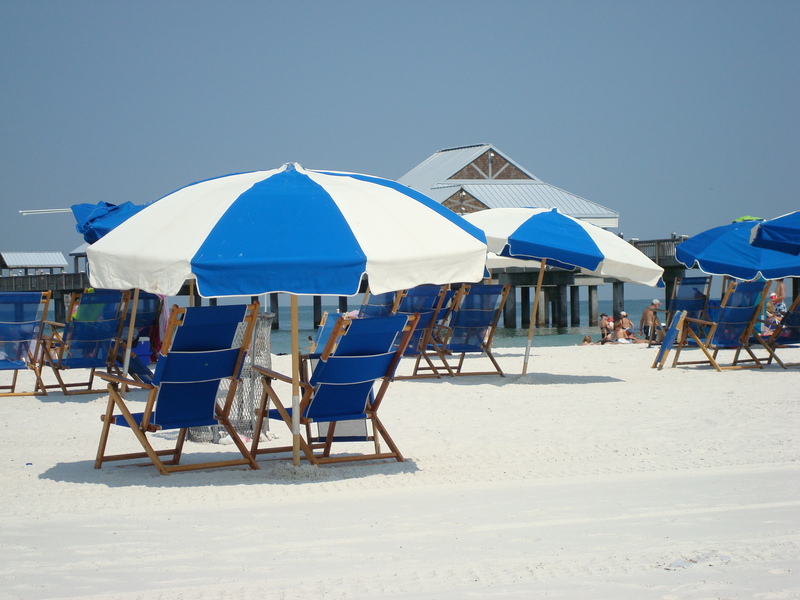 Many people have heard of St. Petersburg and Clearwater but close by there are more local beaches such as Honeymoon Island, Caladesi Island, Fred Howard Park and Sunset beach. Some of these have been voted in the top ten of all beaches in America – beating off competition from California and Hawaii! To see pictures of the complex with all it’s facilities go to our Exterior Page. You know you will have a great time with us but don’t just take our word for it – take a look at our Reviews and Comments Page where we post real feedback from previous guests. Many of our bookings are repeat guests who come year after year, they love it so much here – there is really so much to do and see in the area that one vacation just scratches the surface. Staying in a hotel is almost certain to cost you far more whereas staying with us is like having your own home with all the comforts, facilities and privacy on hand. Also with us you are in a small complex primarily made up of permanent residents so your safety and security is much greater. Check out our Prices Page to see the great value we offer. We haven’t raised our prices for over five years and at the moment our prices for next year are the same. Before you get too carried away do take a look at our Availability Page in case we are already fully booked! Contact us by email or phone to reserve your next vacation or holiday.